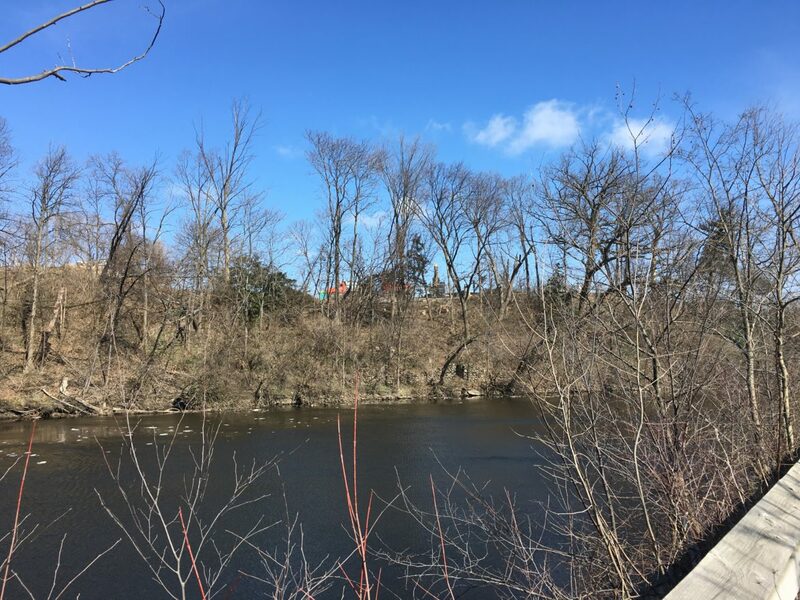 A view of the demolition of the Scott House from across the Red Cedar River. The Scott House was torn down last week to make way for a new BWL substation. The Scott House was a historic landmark known for its incredible architecture and beautiful landscaping. The Sunken Garden drew thousands of people each year, showing off a huge array of colors, flowers and sounds. Those beautiful flowers and sounds of birds chirping, however, have been replaced with sights of bulldozers and sounds of jackhammers and chainsaws. Last week, the historic Scott House was demolished in order to make way for a new, multi-million dollar substation for the Lansing Board of Water and Light. As of this past Wednesday, nothing remains of what used to be the Scott House. 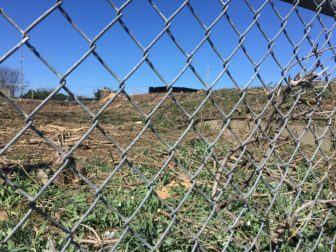 The grass is all dead, tree stumps poke out of the ground, and a chain-linked fence has been put around the property. The walls of the Sunken Garden are the only reminder of what used to be. Despite several attempts by local preservationist organizations and BWL to relocate the house, those plans fell through due to financial issues. The Eckert Power Station is coal-fired, and BWL was committed to retiring the plant by 2020. BWL chose to build the $26 million substation in the location of the Scott House due to how close it is to the underground circuits that connect to Downtown Lansing. The highlighted area is the property that the Scott House once sat upon. The current BWL Headquarters sits just south of the image. 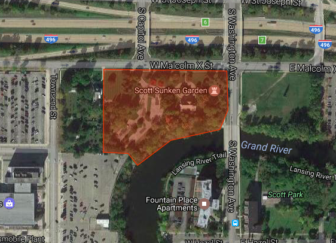 Even though the Scott House is no longer standing, BWL plans on moving the Sunken Garden a few hundred feet down Grand River and add some park and recreational amenities. The Sunken Garden was commissioned by former president of REO Olds Motor Company, Richard Scott, in 1930. The garden was placed on the foundation of the house in which former Michigan Supreme Court Justice Edward Cahill once lived. Cahill raised the first African-American Infantry Unit in Michigan during the Civil War. Some interior fixtures were donated to Habitat for Humanity prior to the demolition, but many local preservationists were not happy with the effort that was made to save what was inside the house. One local group, Preservation Lansing, called the demolition of the Scott House “one of our biggest losses of the last year” in a Facebook post from March 13. The group also argued that the only items salvaged from inside the house were six doors and a staircase. The aftermath of the demolition of the Scott House. A chain-linked fence now surrounds the property, most of it covered with black tarps. In addition to the uproar from local preservationists, the Scott family themselves did not support the proposal to move the house to make way for the substation. Their pleads were shot down, though, as the proposal was approved by the Lansing City Council last year. Dr. Carolyn Loeb, an associate professor in the Residential College in Arts and Humanities at Michigan State University, says that the preservation of historical landmarks is extremely important. LANSING – A federal judge has tossed out a suit accusing Department of Natural Resources (DNR) conservation officers of illegally arresting and prosecuting a hunter who admitted “shining” – using artificial light – for deer at a private Alpena County hunting camp. U.S. District Judge Thomas Ludington found no grounds for Trent Sherman’s claims against the DNR, the officers and department officials.